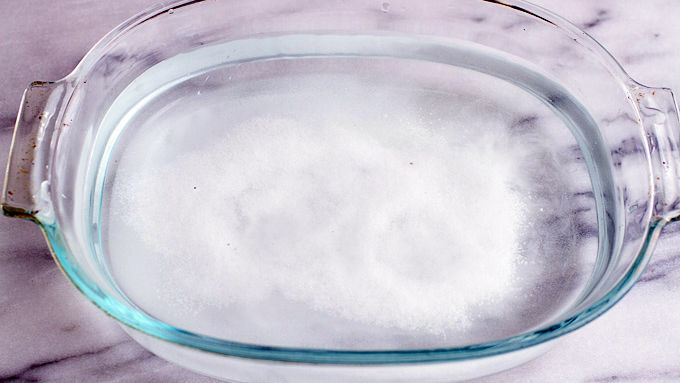 In a large bowl, dissolve the kosher salt and sugar in 3 cups warm water to create a brine. 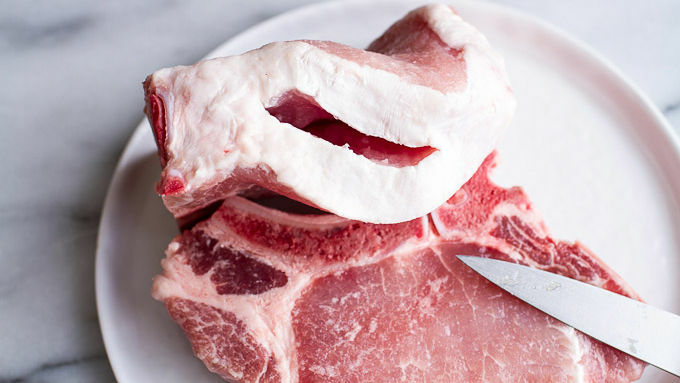 Insert a sharp paring knife into the curved side of each pork chop to make a deep pocket, about 2 inches wide. Soak the chops in the brine for 5-10 minutes. Meanwhile, heat a large skillet over medium heat and add 2 tablespoons olive oil. 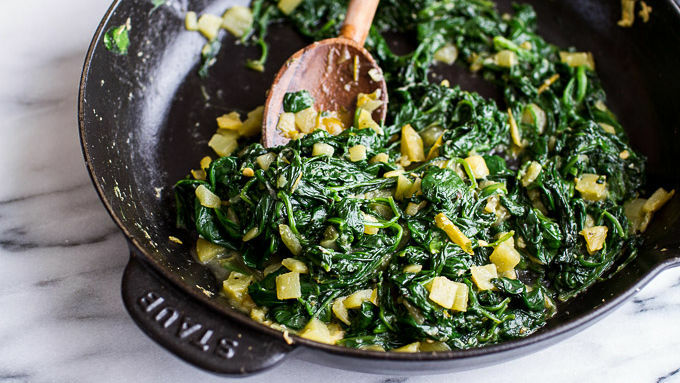 Add the garlic and cook 30 seconds to 1 minute, then toss in the fresh spinach. It will seem like a lot of spinach, but as it cooks it will shrink down. Lower the heat, cover and cook 3-5 minutes or until the spinach is wilted. Stir in the Old El Paso chopped green chilies and a pinch of salt and pepper. Continue to cook uncovered for a minute or two and then remove the spinach from the skillet. Remove the pork chops from the brine and pat dry. 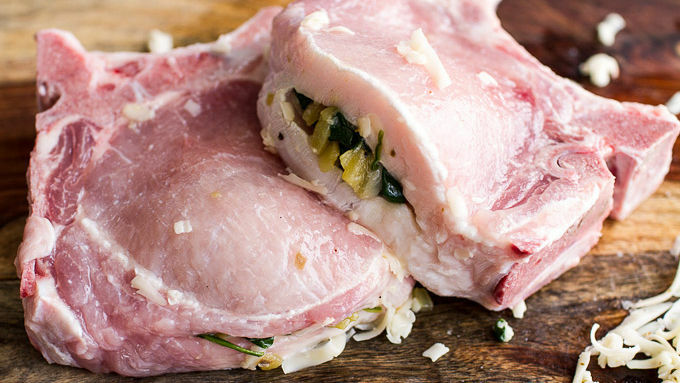 Stuff about 1/4 cup of cheese into the pocket of each pork chop, then stuff with the spinach mixture. 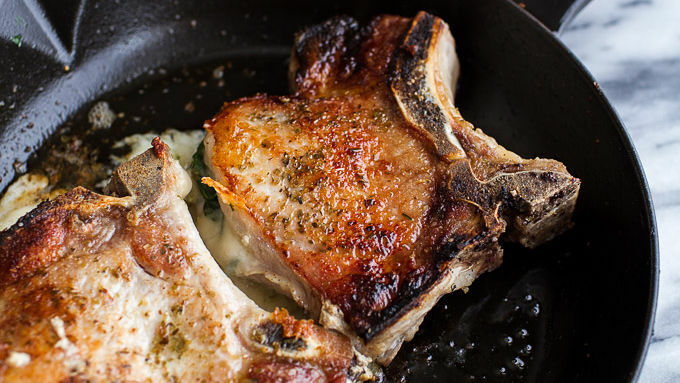 Brush the pork chops with olive oil, sprinkle with the oregano and season with salt and pepper. Heat 2 tablespoons olive oil in a large skillet over medium-high heat. Sear the pork, turning once, until golden brown, 3 to 4 minutes. Cover and cook over medium heat until no longer pink, about 5 to 7 minutes more. Mix salsa ingredients. 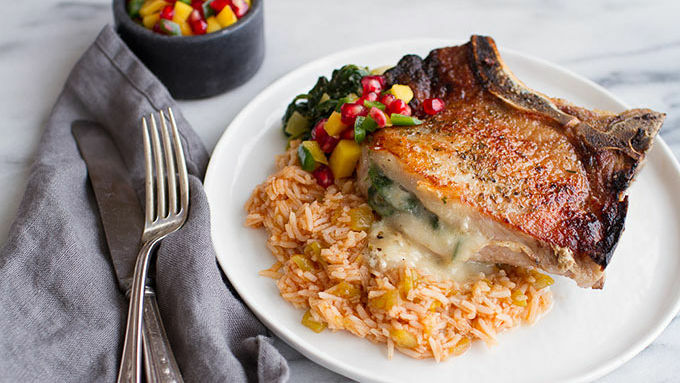 Serve the pork over a bed of Old El Paso Spanish Rice with a scoop of mango salsa. Enjoy! Need a quick on-the-go dinner? You got it. So how do you feel about pork chops? Up until a couple weeks ago, I had never cooked with pork CHOPS. I know, I know – and I call myself a food blogger? Yeah. I cook with pork all the time, but chops have never been in my repertoire. So a couple of weeks ago the thought occurred to me that I should probably try my hand at a simple pork chop recipe. My mind swayed towards a seared Mexican, cheesy chop. How could you ever go wrong with a cheesy chop? The verdict? Seared pork chops are the best – a super quick and easy dinner. I love these! Of course, it helps that each chop gets generously stuffed with a little pepper jack cheese and sautéed spinach. SO good. Feel free to use your favorite cheese: Cheddar, smoked gouda and even a blue cheese would all be awesome. I served my chops with some Old El Paso Spanish Rice and quick mango-pomegranate salsa to finish things off. It was the perfect 30-minute meal. Especially perfect for this holiday season (the busiest time of the year)!